Aqua Mini Retractor with Stainless Steel Carabiner by Aqua at Kerinci. MPN: LR3404. Hurry! Limited time offer. Offer valid only while supplies last. Carabiner: an oblong metal ring with a spring clip or locking devise; used in mountaineering to attach a rope to a piton or to connect two ropes. Carabiner: an oblong metal ring with a spring clip or locking devise; used in mountaineering to attach a rope to a piton or to connect two ropes. Strong and dependable for climbing it will also work well for diving. We always need to attach more stuff to our equipment to free up our hands when we need them. Lanyards for lights, cameras, gauges, game bags, or maybe even a fish stringer when spear fishing. Having a few spare attachment devises in your gear bag is a must for the serious diver. With the Mini Retractor with Stainless Steel Carabiner you can keep your Accessories Safe-and-Secure with Stainless Steel Cable. The Mini Retractor Extends up to 25" (63.5 cm) with 24 oz (680.4 g) Retraction Force, great for Dive Lights or Cameras. This Auto-Recoil Device allows for Quick-and-Easy Access to Equipment secured to BCD or Weight Belt. 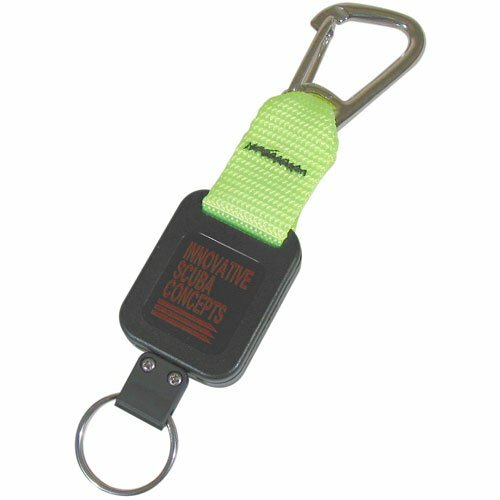 Retractor is equipped with a Corrosion Resistant Stainless Steel Carabiner Clip with Split Ring for Attachment of Accessories or Console. Retractor protects equipment and damage to the environment by keeping attached item close to the vest. Retractor makes a Great Save-a-Dive Kit Item. Strong and Dependable for Climbing it will Work Well for Diving!